Scroll down on this page to find the cruise timetable & pricing. There are two landings to catch the Popeye from. The Elder Park landing is a five minute walk along King William Street from North Terrace towards the Adelaide Festival Theatre. On the left just past the theatre you will see the rotunda and Popeye’s Elder Park Landing. The Zoo landing is located down the stairs, below the Frome Road pedestrian crossing closest to the Zoo entrance. If you’d like to visit us at our office, we’re locates in Lounders Boatshed, just to the rear of Lounders Cafe. Drop in and say hello! Call us during business hours on our office line at (08) 8232 7994. Or you’re welcome to send us a private booking request at bookings@thepopeye.com.au , ask us any general questions on info@thepopeye.com.au or check us out on facebook! Click here to find more information about hosting your own private function. The Popeye currently isn’t wheelchair accessible. We’re working on it for the future and hope to have them ready soon! For less abled walkers, there are two small steps up to the boat and a further four to get inside. Railing is on one side of the entrance to assist, as well as our friendly drivers. For the hearing impaired we have a downloadable commentary which is available via this link. The Popeye does not have restroom facilities on board. If you are planning a trip on the Popeye please make use of the nearby public toilets before and after your cruise. There is no need to pre book for our regular cruises, tickets are available for purchase on board with cash or EFTPOS facilities. However, if you do like coming prepared feel free to purchase tickets online here! Click here to book tickets to our ever popular High Tea. All of the information can be found on the event description or call us in the office for a more detailed description. If you would like to book a High Tea on Popeye privately, we can do that too! Click here to book tickets to a Prohibition Gin Masterclass. All of the information can be found on the event description and further discussions on our Facebook event. To receive further information about dates please click ‘interested’ on our Facebook events to be kept in the loop! If you would like to book a Gin Cruise on Popeye privately, we can do that too. See Adelaide from the best seat in the house, by cruising along The Torrens River in the heart of the city in a heritage icon. Enjoy a 40-50 minute cruise with a running live commentary from our friendly skipper. 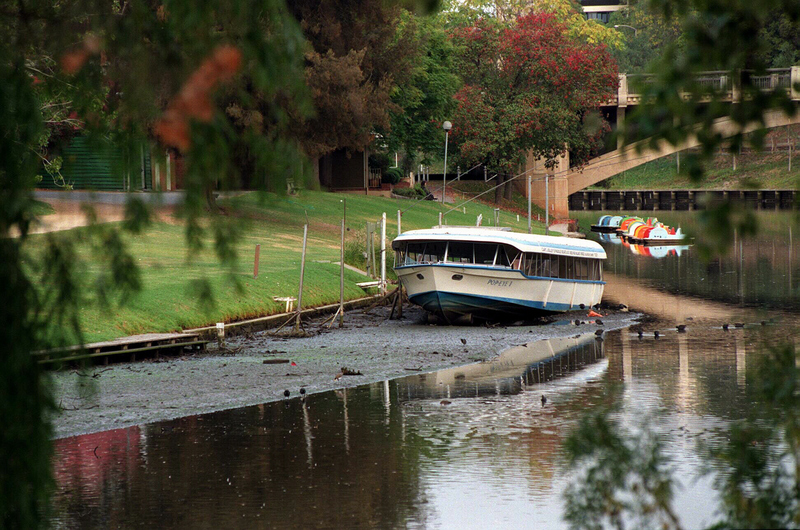 Learn about the historical importance of the River Torrens surrounds and gain an understanding of how Adelaide is progressing as a city and why it’s been ranked amongst the top liveable cities in the world! The cruise will take you past the Festival Center, Adelaide’s SAHMRI building, beautiful parklands, Adelaide University and more. Questions are always welcome and picturesque photo opportunities a given. There’s really only one way to see Adelaide from the River Torrens and that’s on board the Popeye. We’ve been doing it for generations because the Popeye first started 75 years ago. 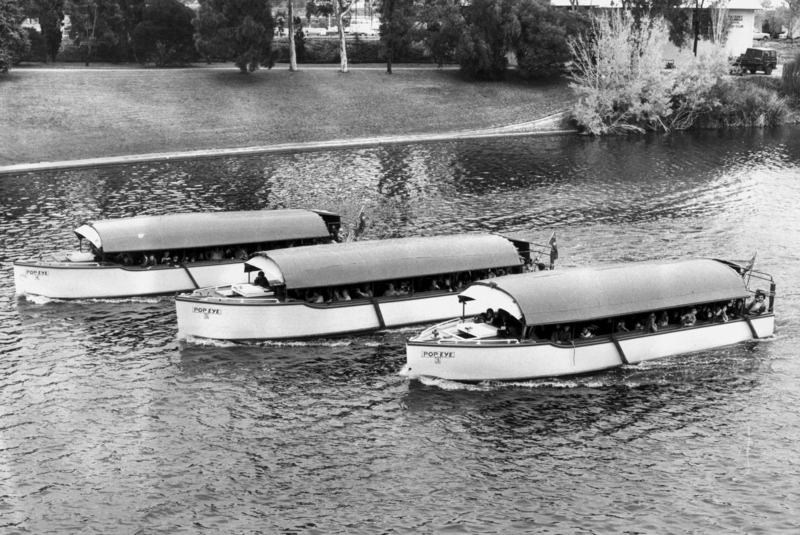 The “Popeye” boats are privately owned recreational ferries that operate on the lake between Elder Park and the Adelaide Zoo. 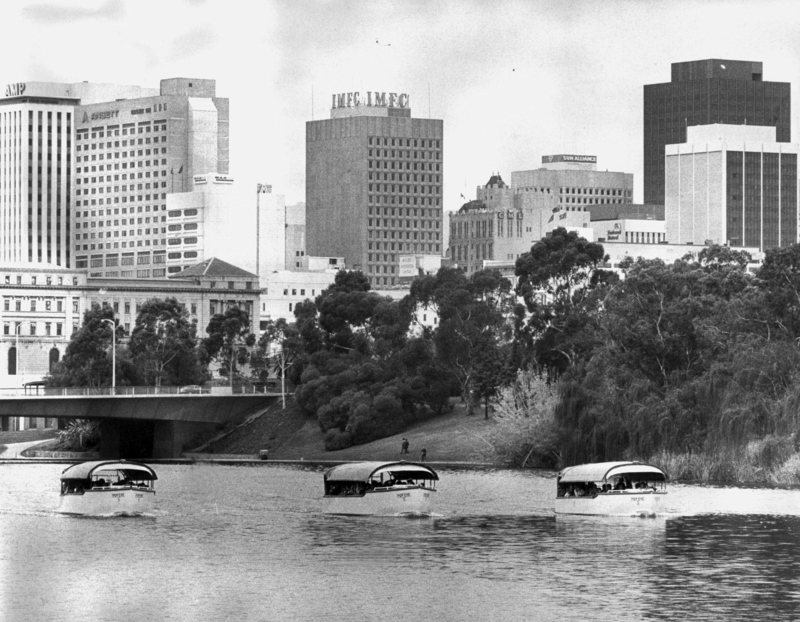 The first boat was launched on the Torrens Lake by Gordon Watts in 1935. It was a 25-foot (7.6 m) boat, built on the banks of the River Torrens to hold up to 20 passengers and named Popeye 1. 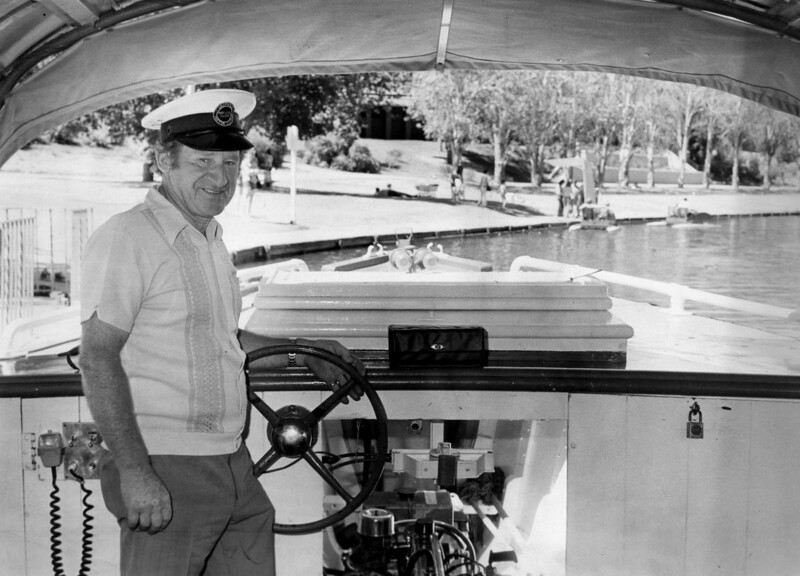 Watts purchased a former Glenelg cruise boat in 1948 and placed it in service as Popeye 2. Over the next two years three new jarrah hulled boats were built at Port Adelaide; carrying 40 passengers each they were numbered Popeye 3 through Popeye 5. Trips on the Popeyes from Elder Park to the zoo became a treasured family outing and the boats hosted weddings and other events. 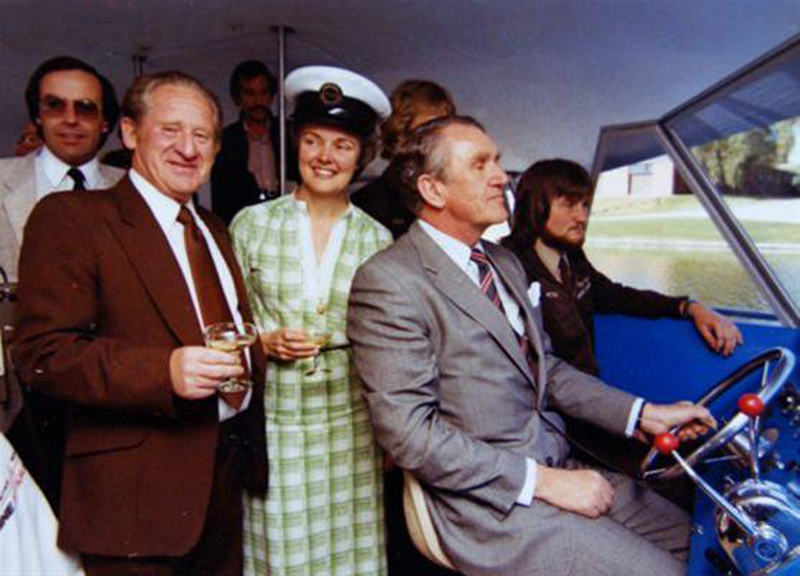 Prime Minister Malcolm Fraser officially launched three new fibreglass models named Popeyes I, II and III in 1982 as the wooden boats’ replacements. In 2011, Tony and Lidija Shuman purchased the Popeye fleet and have worked tirelessly learning the ropes and hoping to make your experience an enjoyable and memorable event. The Popeye is up there with the frog cake, the hills hoist and the Glenelg tram – they are all officially a State Heritage Icon. So why not hop on the Popeye again soon. We enjoyed an informative trip along parts of the River Torrens. Our guide was most knowledgeable of the region. We saw some amazing buildings including the Adelaide Oval. This is a definite for all ages and a relaxing meander along the river. I definitely recommend it! When I traveled to Adelaide, my friends took me on the Popeye boat on my first day in town. It was a beautiful clear day, and the ride down the river was an awesome tour of the riverfront properties. I enjoyed the views and the information! I recently took my grandchildren for a ride on this iconic river boat...everyone had so much fun coasting down the Torrens River, up to the Adelaide Zoo ( can disembark here to visit the Zoo) and back to Elder Park with an informative commentary by Popeye's skipper. I just wanted to thank you for the lovely high tea I attended over the weekend. It was one of the best I’ve attended. I particularly liked the traditional aspects of the day, including the high tea ladies and the food. All the food was great and the ladies and driver were all very friendly and personable. It was a really well organised, quaint and enjoyable afternoon. Thank you for such a lovely and memorable event. Yesterday my mother and I went on the High Tea on the Popeye and I just wanted to write to let you know how much we enjoyed it. I am gluten free and the food that was provided for me was absolutely beautiful. Mum had such a lovely time and is already talking about going again. I know that she must have loved it because she actually remembered the trip which is very rare (she has dementia). Again thank you to everyone for making this a really special day. Great 45 minutes spent with family & interstate friend in late April. The boat captain was very informative & I learnt things that I had never been told before. I think I was a small child when I was there last & I am nudging 60 now !! Great thing to do for tourists and locals alike. KuchsHaven't done this since childhood !